I’m about to start my seedlings for Spring planting and the Farmer’s Market. Tough choices. Some will be started (or already are) by cuttings, some from seed. Most require at least 8 weeks to reach fruition, and some longer (and some much longer) so getting started now is imperative. But I thought I would share my rules of seed starting with you, in case you are new to gardening from scratch. Equipment and Supplies – Only ever use sterilized materials. 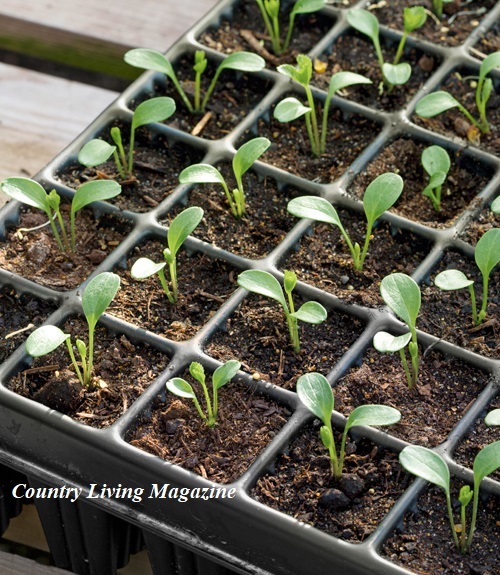 I prefer individual plastic starter 2”-4” pots because peat, cowpots and terracotta can wick the moisture right out of your starts and because I can rearrange as the seedlings grow up so that they are grouped according to height (see use of grow lights below). 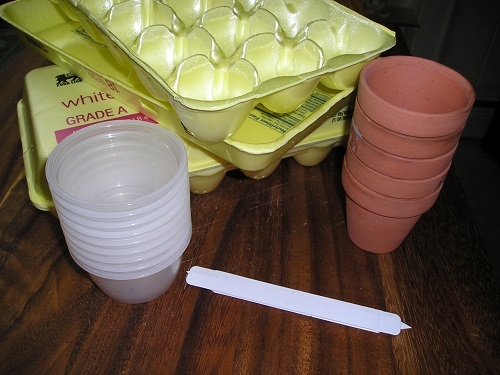 Having said that, I have started seeds successfully using toilet paper rolls and egg cartons. If using plastic, clean your pots or seed starting supplies with a bleach solution and rinse very well. Use only sterilized seed starter medium (I use organic). 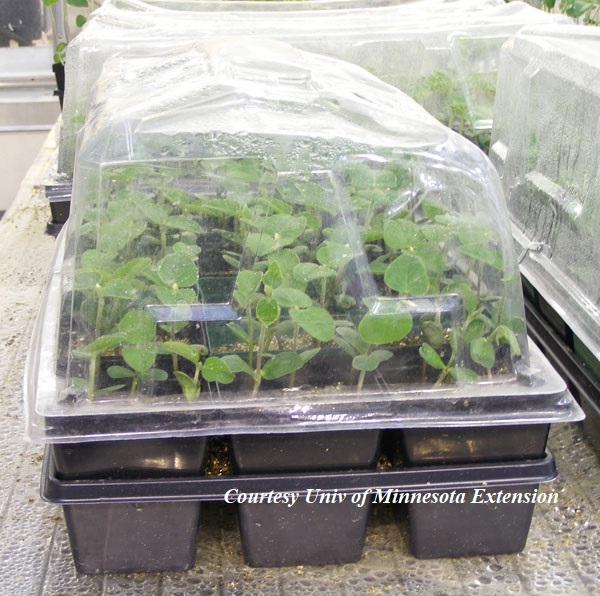 Any surface where contact is made with your seed pots must also be sterilized, such as your trays and heat mats. This might sound excessive, but it is an important step to success and will help prevent problems. I use grow lights because I don’t like spindly seedlings and that’s what you’ll get without them. Also, you can give them an “early Spring” by gradually increasing the time the lights are on to 14 hours/day regardless of time of year. I also use heat mats for those seedlings, like peppers, which require them. But many herbs and strawberries actually do not. I use a hydroponic system for those seeds which appreciate wet feet (but I don’t use the chemicals typical of hydroponics). And soon I’ll be using a cloning machine for cuttings like Bay Laurel and French Tarragon. Doesn’t have to be expensive to work! Timing is everything! Know your last frost date and then use a calendar to count backwards for your start dates for each type of seed you will be starting. Given the erratic weather, allow extra time. And don’t forget that the seedlings will need to be “hardened off” for a week or so before introducing them to your garden. 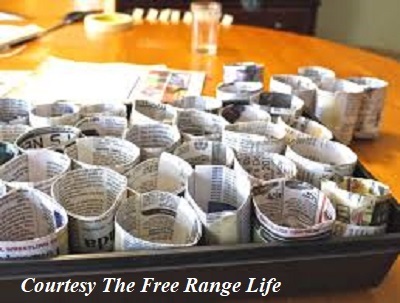 Use quality seeds and healthy cuttings. I use old seeds from my exiting inventory and usually have no problems, but its always best to use fresh new seed when possible. Seed viability varies by type … tomatoes, peppers and eggplants are viable much longer than parsnips, for example. There are wonderful charts online that can tell you exactly what to expect. If you have seeds left over from a previous season, or seeds you have saved yourself, the best way to store them is in a sealed polybag in the back of the fridge where they will not be subject to variations in temperature or humidity. If you are concerned about viability, do a test by putting a few of the seeds in damp paper towels and waiting for them to sprout. 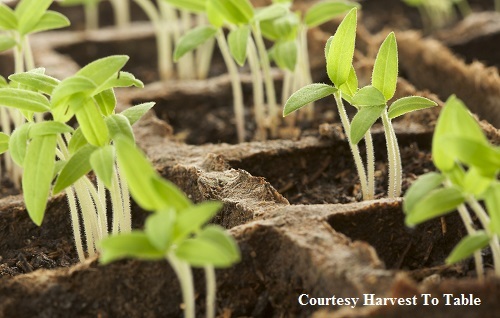 Know the planting requirements of your seeds. Some seeds are light-dependent germinators and should not be covered, but protected from drying out with a humidity dome or plastic bag. Others need to be sown deeper with bottom moisture. Some require a period of cold “stratification” mimicking a winter’s hibernation in order to break dormancy and germination. Finally, patience really is a virtue in gardening. Give seeds time. Some seeds like strawberries may take 4 weeks to germinate. Others like cat grass will pop up almost overnight in the right conditions. Once you have achieved germination you need to be vigilant, watching for problems particularly as concerns humidity. I love liquid organic food diluted to appropriate levels for my seed starts (read the labels). 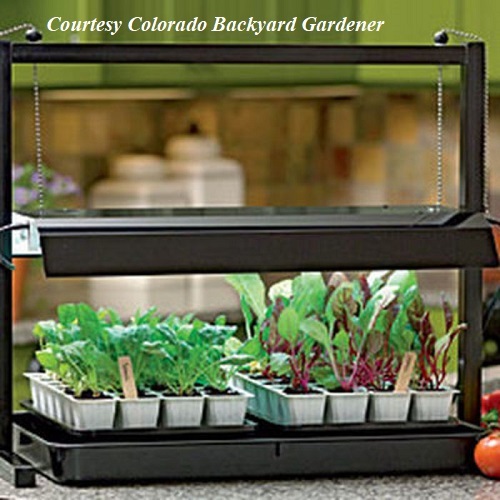 And keep your grow lights close, raising them as your seedlings grow. I also give my starts a period of gentle air flow every day either with a portable fan or an overhead fan. This helps to strengthen them and also shortens the time needed for hardening off. 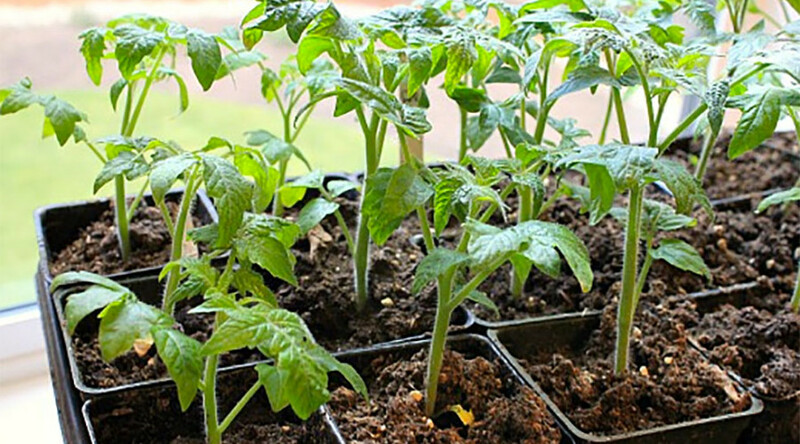 Be mindful of the days to maturity of each variety, usually stated as “from transplant”, such as tomtoes, or just number of days from sowing as with lettuce. For me, the hardest part of seed starting is making choices of varieties. I have limited full sun areas in my garden so I try to plot out what will use those spaces pretty tightly – not only space but also calendar. You can, for example, start some quick growing lettuces or radishes in the same space as you will eventually be putting your sun hog tomatoes. Asparagus can go in a partially sunny spot out of the way of foot traffic. If you are going to plant 3 Sisters, put your corn in first so it has a chance to rise above the level of the squash and beans. This entry was posted in Garden and tagged home garden, organic seeds, seed start by Cherry Gal. Bookmark the permalink.